"Honolulu Stories" colors its pages with nine different languages, portraying the novelty of ethnic diversity that Honolulu has been known for. It's not often that a book is a museum piece, but right out of the gate, that's what "Honolulu Stories" feels like. As the Academy of Arts collects art, as the Bishop Museum collects culture, as the Judiciary History Center collects briefs, this book collects various writings about the city of Honolulu, pinned to the pages like butterflies in a glass case. 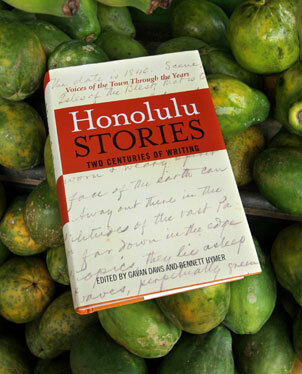 "Honolulu Stories -- Two Centuries of Writing"
The pieces are studiously selected by editors Gavan Daws and Bennett Hymer, and the range is vast indeed, from native Hawaiian poems to a previously unpublished Mark Twain fragment to the gritty wartime observations of James Jones and William Bradford Huie, to the local-kine literary vibe recently dominated by Bamboo Ridge. Don Blanding is, of course, well represented, as are dramatic icons like Ed Sakamoto and Milton Murayama, plus a broad smattering of poetry (Tino Ramirez, Mavis Hara, many others), tone pieces, observational works and, frankly, jokes and song lyrics. If there's a local hero in the midst of all this largesse, it seems to be Lee Tonouchi, who, nearly single-handedly, has given pidgin its own literary groove. Hey, where's Earl Derr Biggers? Pulp authors are conspicuously absent. It all adds up to a rollicking dash through Honolulu's literary history, both from those living within it and by those on the outside looking in. Honolulu is one of those unique municipalities with a feel unlike any other city. That comes across in these pages. It must have taken forever to track down publishing rights. "Honolulu Stories" is a noble effort, obviously created with a lot of labor and the best of intentions. So why does it feel like the world's biggest homework assignment? 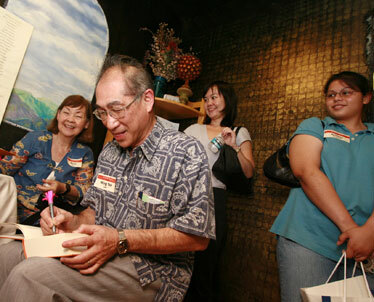 Wing Tek Lum signed a book at a reception held at Coffee Talk in Kaimuki on Wednesday evening. The party was for the authors who contributed to "Honolulu Stories." The book is a survey, no error, which means it's a mile wide and an inch deep. Just when you get into a piece, it ends -- often arbitrarily -- and you're on to the next thing. It's like going to a movie and seeing only previews. Actually, like seeing only clips and snippets. They add up to a bigger picture, but that's a big commitment of time, and more, a commitment of attention span, because the pieces don't lead you into an immersive involvement with the literary form. By design, there's no literary arc, no storytelling process. Just blasts of fragments. Also, although it's nice in the abstract sense to include pieces in native Chinese and Tagalog and other languages, it's a waste of paper to the average monolingual reader. On a practical level, the collected pieces add up to a dictionary-size, weighty tome that can fall on your head and knock you out when you start to snooze whilst reading. Don't ask how I know this. It might have been better for the work to have been subdivided into shorter, thematic volumes. Even if you read a chapter a night, it will take years to wade through it, and because "Honolulu Stories" is clearly good for your literary education, you can't escape the nagging feeling there's a book report due.